For a marketing agency such as ourselves many a project begins through an exploratory meeting with an existing or new potential client. 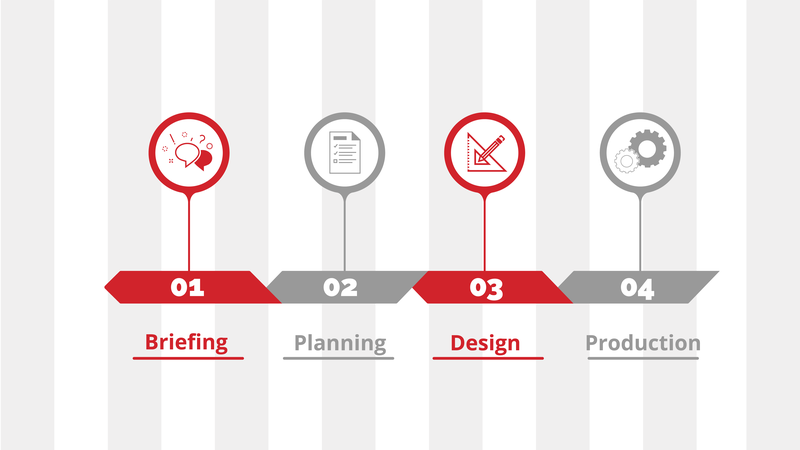 This is the briefing stage, when the client explains their project, aims and requirements, and gives us a chance to ask the questions that give us a clear picture of what it is they wish to achieve, and how we can help them do it. Having met with the client, we discuss the potential project internally and prepare a pricing quote that is usually also accompanied by a more detailed proposal with suggested plan of action. The proposal is modular and broken down into different components, so that it is easier for the client to pick and choose or indeed prioritise the elements they require most urgently. Once the quote is accepted, we have the green light to proceed and the initial 50% is paid, we prepare a planning schedule made up of a prioritised list of things that need to be done. Whether they are fulfilled in-house and/or by third parties, we manage the process tightly from a budget, quality, creativity and timekeeping point of view. In other words: we take the commitment to meet and raise your expectations within the agreed budget and timeframe very seriously, and while we can respond to urgencies very quickly, we believe the best and most accurate and creative work is done when there is a little time to do things properly. Work begins in earnest when we set out to produce texts, design branding or marketing material and/or create web pages according to our client’s brief. We always aim to give the client what they have asked for, while letting our creativity flow so that they have other options to consider as well. Especially in design, and above all when you’re creating the corporate look or brand identity of a business or product/service. This is the truly creative part of the job. Designs and other drafts are subjected to careful scrutiny in-house, and will have been amended, replaced or streamlined by the time they are presented to our clients. We present our design work in an attractive way that makes it easier for people to picture them in end-user application, and of course we don’t just submit ideas but explain the reasons for them, as professional marketing companies won’t simply do something because it is pretty – it has to engage the target audience, communicate a message and represent the values and identity of the company in question too. With the client’s feedback the style is tweaked and established until it is just right, and from this moment onwards conceptual design becomes production as we apply the design style or tone of voice to give shape to marketing material, brochures, websites as well as filling them with content. Each stage of completion is done against a time schedule, and while we are happy to be faster, we try never to be the ones that cause delays. After final acceptance of the material produced it is then proofed and checked by ourselves before being signed off by the client. If printing or another form of third-party production is required, we will by now have provided the client with several competitive quotes, liaised with the chosen supplier, alerted them of the planning and will next be working with them to ensure optimal quality delivery on time – or sooner.